It was one Friday evening and raining continuously. We decided to get some wine. My wife wanted something to accompany the wine, and after digging through the refrigerator, came out with 9 mushrooms. 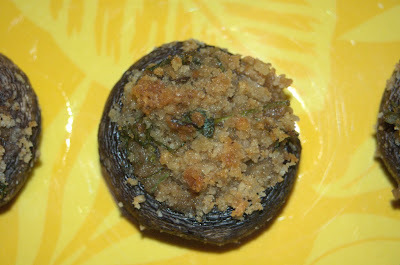 Then she went to the Food Network website and got this recipe for stuffed mushroom by Giada De Lauretiis. Since we didn’t have the ingredients the recipe called for, she modified the recipe accordingly. Here is the modified recipe as we had it. The outcome was fantastic. Please note that the quantity of stuffing we prepared was for 28 mushrooms, but made only 9 of them. We put away the rest of the stuffing in the freezer for another day. Before you start the following, set the oven to 400 degrees Fahrenheit (204.444 degrees Celsius). Take 2 slices of rye bread and toast it till the bread is light brown. If you use regular white bread you would need 3 slices. Break down the bread into coarse crumbs. To this, add the cheese, garlic, finely chopped coriander leaves, rosemary leaves, salt and pepper to taste, and 3 tbsp olive oil and mix everything well in a bowl. On a baking sheet, drizzle some olive oil to coat the sheet. Ready the mushrooms by removing the stems from each one of them. With a spoon, put the filling into the mushroom cavities and place them on the baking sheet, with the stuffing side facing up. 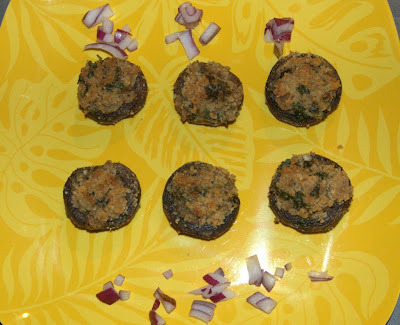 In order to maintain moistness, pour the remaining oil over the filling on each mushroom and place the sheet in the oven. We only put 9 mushrooms as that’s all we had at home. The original recipe calls for baking the 28 mushrooms for 25 minutes at 400 degrees F, till the mushrooms are tender and the filling is golden on top. We left the 9 mushrooms in there for 17 minutes until they achieved the golden color. I think it’s better to use that as a benchmark, but make sure the mushrooms don’t start looking dry. Balance it out properly. At this point the mushrooms are ready. When we served ourselves (we had it with some Blackstone Chardonnay, nice white wine), on the spur of the moment, I put some fresh chopped red onions on top of the mushrooms and squeezed lime juice, and seasoned it with some salt to taste. It was one hell of an appetizer, and I just loved it. Thanks Giada, and Anita for trying this recipe with modifications. Ingredient Substitute/s: You can substitute the cheese with any cheese you may have that is kind of hard so it can be easily grated, like Parmesan cheese, even the powdered one made by Kraft, etc. Same goes for the bread. If you are a vegan, you can easily substitute the cheese with 1/2 cup more of dried bread crumbs and not loose much of the taste in the process, as the ingredients are perfectly complementary to each other.